Blog | Welcome to Tech-Away of Texas | Take Away the Worry, Take Away the Mess with Tech-Away of Texas!! 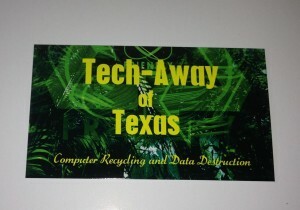 Not Just Any Electronics Recycler, YOUR Electronics Recycling & Data Destruction Experts!! Take Away the Worry, Take Away the Mess with Tech-Away of Texas!! Not Just Any Electronics Recycler, YOUR Electronics Recycling & Data Destruction Experts!! Tech-Away recommends that you take the time to blow out your computer every 6-12 months. But why? Have you ever wondered how your ceiling fan could have possibly gathered so much nasty dust? Every time I climb the ladder to dust mine, I’m totally disgusted. Where did all this grimy dirt come from? I hate to tell you this folks, but the fans inside your computer could be even worse than that ceiling fan. Soon I will be posting a video tutorial of how to “blow out” your PC. Have you ever wondered why there are cans of compressed air in the electronics aisles? Well, I’m going to show you how to use those correctly, and for you guys that like any excuse to use your power tools, I’ve got another route we can take using your air compressor. No worries, this is not difficult! Anyone can do it. So why is it a good idea to blow the dust out of your computer, you ask? Well, just like the build-upon your ceiling fan, that gunk is filling up the inside of your PC. Unfortunately, this build-up can cause your PC to overheat because it’s creating a blanket of dust bunnies that trap and keep the heat in. The whole purpose of the fan is to get the heat out, so you can imagine the struggle. The build-up also creates a heavier load for the fan which can be stressful on the fan motor. Once your motor goes out, most assuredly the heat sink and processor will overheat and can fry your motherboard. Let’s take the safe route and keep it clean and tidy to assure the longevity of your computer. Follow this Link to Watch our Video showing the two methods we use to clean out our Computers. This entry was posted in Uncategorized on November 21, 2015 by marshall. Well, we have been meaning to visit the Oklahoma State Auction for a while, and we were finally able to go on Friday. Although it is much smaller than the Ohio State Auction that we often visit when we go to Ohio to see Mandy’s family, it was still a good trip for us. We were able to bring home a trailer load of servers, battery back-ups, and printers. While we were up in OKC we also delivered to a client up there. As I drove through Moore I reflected on the many people who lost their homes, belongings, or loved ones in the recent tornadoes and we offered up a prayer on behalf of that community. May God bless ya’ll with a strengthened faith and determination to rebuild and get on with your lives…and to know that God has a plan for ya’ll. This entry was posted in Uncategorized and tagged Asset Managment, computer recycling, dallas computer recyclers, moore tornadoes, oklahoma city on June 17, 2013 by marshall. Well We just got the Blog Set Up!!!!! I guess today is the first day of the Tech-Away of Texas blog. Check back often as we have many great things planed for the website and the blog. It should be informative and enjoyable. We will all learn alot together as we comment and share with one another. We got our new business cards today and will be giving out 3000 of the at the small business expo in 2 weeks. This entry was posted in Uncategorized and tagged computer, computer recycling, computer scrap, dallas, dallas computer recyclers, data destruction, entreleadership, ewaste on June 6, 2013 by marshall.